SouleMama: "The Return of Spring" Coloring Book and More! 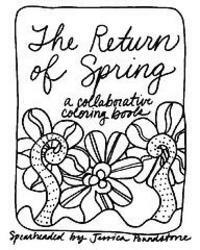 "The Return of Spring" Coloring Book and More! I saw this great coloring book on GetCrafty and had to check it out. There are some really fun illustrations in here--perfect for bringing springtime on! Calvin and I have been having lots of fun coloring it in. To get your own (free!) copy, visit her Jessica's blog and send her an email requesting the pdf file. In return, she asks you to link to a "finished" page (will do soon!). 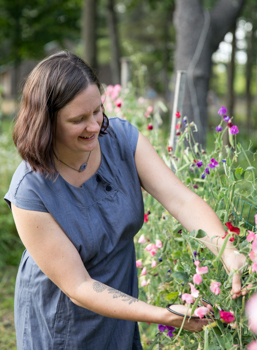 Thanks, Jessica, for putting it together! What a great idea! 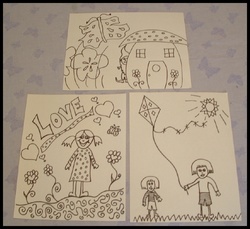 We were so inspired by the idea of creating your own coloring book, that we're doing just that! Yesterday I worked on a few pictures for it, and hope to do some more today. I've copied a few for the kids to color in already, but I'm thinking about putting together a bunch of springtime drawings, copying and binding them so they look like a "real" coloring book (hee hee), and including them in their Easter baskets. 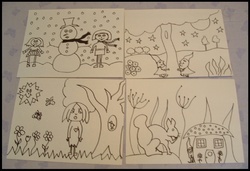 Here's a quick pic of the drawings I did yesterday to get started. Be gentle--my drawing skills are so rusty, but it was fun nonetheless. And luckily, my kids are forgiving!